You are here: world-mysteries.com » science mysteries » science of god? Mankind has developed over millions of years to arrive where we are today, and even now we are not yet at the pinnacle of evolution, if there can ever be such a thing. We are evolving daily. Maybe not enough for us to see in our short lives and maybe not physically changing with each generation, but we are evolving ideas and technical abilities: new and truly wonderful tools which help us, force us even, to change and adapt in a pseudo evolutionary way. Regardless of whether or not there is a God, simple human knowledge of self, rationality and emotions all contribute to our present revolutionary pace. And yet, we still need to answer the most fundamental question of where we come from with the idea of God. Perhaps we should try to look at the whole thing in a different way, and by doing so, understand how we could be manipulated because of these basic human traits. On the face of it, historically, there does not seem to have been much of a challenge to these evolutionary oriented beliefs until the enlightened age of philosophy. This appears to be the time when man challenged all ideas, even his own. The early philosophers required their students to assume what they were being taught was wrong and to come up with their own ideas. Although man was challenging the assumptions of life long before the existence of the classical philosophers. However, apart from what can be learned from their buildings, new understanding can come from the early writings in which secrets have been locked away for thousands of years, only to be understood by those with the eyes to see. We can see from these writings and structures that man has understood, or found the need for, a clear beginning and end. A cycle of life emerged and with it came a religious copy of this cycle, more complex and intuitive than we could ever imagine. Recently emerging data has put the beginning of civilisation further back in time, and has proved that there was greater knowledge among early peoples. With every passing day we find new evidence for the purpose of megalithic structures. The secret resonance, the effects of radiation causing lights in the sky, the planetary alignments, Earth energies and pathways, the symbolism of life and death; all these things are coming under closer scrutiny and many are being proven. The fact that our ancestors knew so much about the cycles of life is partly the cause of the problem of understanding our beginning. These ideas and beliefs in life cycles over many thousands of years and our own in-built cyclical nature will not allow us to comprehend anything without a start and finish. Accepting that we do not understand is a good beginning. We, by the very definition of being alive, with life and death cyclic patterns, simply cannot understand the beginning, if indeed there was one. Our whole lives are based around cycles. The element of time causes cycles to come into existence. Without time there are no cycles, without cycles there is no time. On a simple level, cycles are about birth and death, sunrise and sunset, the waxing and waning of the moon, the changing of the seasons, the tides of the sea, the reproductive cycle of females. All these are inexorably linked with the entire universe. The difference between our ancient ancestors and us is that we have virtually forgotten about these links while their whole lives simply revolved around the concept of the natural cycle. Our ancestors understood that the universe and everything within it revolved around a massive repetition of cycles. We are only just beginning to understand the harmony in which we have lived and the disharmony we are causing with our constant damage of the finely balanced environment, which has taken the last 15 billion years to achieve. The earth has subtle energy waves which some call Ley Lines and which the Chinese call Feng Shui or Dragon Paths. These forces are scientifically proven to exist, although much that is blatantly unscientific is also claimed for them. Not all Ley Lines are scientifically provable, in fact the statistics even show that Ley Lines are “probable” give any number of sacred sites in a given area – things do just line up by chance. Some, though, need closer scrutiny – some evade the statistics of science and defy reason. When we alter the environment, we alter the balance of these paths, and in turn, the subtle balance between the earth and the universe. We are also beginning to understand the effects we are having, not only on the environment but also on our own psyches. It is emerging that the energy of our surroundings does have an effect upon our minds. For example, some people suffer from Seasonal Affective Disorder otherwise known as SAD, as a result of the lack of sunlight. This recently discovered cyclic problem affects us all to some extent. This shows that if we can suffer from problems because of a loss of sunlight, which is on the electromagnetic spectrum, then we could, in theory, suffer other problems caused by imbalances in other electromagnetic radiation. It is our belief that our ancestors understood these subtleties and even utilised them for control, harnessing the power of the universe and the power of the mind to control the people. As if to give the game away they placed clues for us to find. All of their rituals, their religions, cults, gods, demigods, all of their lives, were linked to the cycles of the universe. And this is how the ancients understood the powers of the universe, through their gods. They did not conceive of electromagnetic power as we do, but rather as god given signs and portents, as the power of the god’s to be tapped into. Without cycles, there would be no life. The entire universe would be one great chaotic soup. And according to scientists, this is how it all began. Over the course of billions of years it settled down into regular patterns. Thermodynamics shows us that when two systems come together, for example hot and cold, an equilibrium is naturally achieved, albeit dependent upon many factors such as environment, velocity, mass and much more. This follows through from the universal scale right down to our own bodies and lives, which find equilibrium with the rest of the universe. Taking into account all the factors that affect us: the solar wind and flares, electromagnetism, gravity, heat, radiation, we still manage eventually, to come into balance with these things. It is our understanding of this fact, which has altered. We have come through thousands of years of beliefs, through a hundred years of rationalism and this perception has been lost, only now to have been found again through modern science. The Thermodynamic Cycle shows how nature, in relation to heat and cold, constantly repeats itself. We can see this in the broader aspect of the Earth's seasons, although as time goes by small amounts of energy are lost along the way and we know that planet Earth has only a certain life span. If the Earth kept all of its energy it would be perpetual and would cycle forever. As it is, the energy will be converted into something else the universe needs. On a smaller scale, this cycle also applies to us. At death we will convert to some other form of energy, after having lost energy all through our lives. Electromagnetic Radiation waves are produced by the acceleration, or oscillation, of an electric charge. These waves are both electric and magnetic. The frequency of the waves can range from high to low. Visible light is a small part of the electromagnetic spectrum, as are X-rays, gamma rays, ultraviolet radiation, infrared radiation and micro and radio waves. Electromagnetic waves need no medium for transmission. Therefore they can travel through almost anything, including space. Virtually everything gives off electromagnetic radiation, including the sun, the moon, stars and the Earth. To call electromagnetic radiation 'waves', however, did not account for all the properties discovered. Max Planck showed that radiation occurred in finite quanta of energy and was, therefore, also particles. We now understand radiation in two ways, particle and wave, although they react together. This quantum theory can now be brought into line with electromagnetic radiation. A wave and particle is daily bombarding us and we have almost no idea what it is doing nor the effect it has on us. In Geophysics, we study the phenomena of the Earth's magnetic field, the heat flow, seismic waves and the force of gravity. We also look into the outer-space activity that can affect us, such as solar winds and manifestations of cosmic radiation which affect the Earth's own radiation. In Terrestrial magnetism we have found that the magnetic field is related to the motion of fluid, which conducts electricity within the Earth. The rotation of the Earth within the gravitational pull of the moon and sun periodically imposes gravitational effects upon the earth, the changing tides and solid Earth tides, which in turn alter the electromagnetism of the earth. All these things happen cyclically and all these things affect us. Every time a volcano erupts, the Earth's magnetic field alters orientation and strength. The depth of the mantle increases or decreases the conductivity of the electromagnetic wave. When the solar wind approaches, the Earth forms a magnetic sheath, called the magnetosphere, which acts like a giant natural dynamo more than 60,000 miles across. When the high-energy particles of solar radiation penetrate this sheath and enter the radiation belts we see the beautiful phenomenon called the aurora. The electromagnetic wave possesses energy according to its wavelength and frequency. This energy is imparted into matter when the radiation is absorbed. Michael Faraday even went so far as to say that the electromagnetic field was the lowest form of physical reality. The resonance caused by the various frequencies of the particle waves affects the molecules within our bodies. Every molecule in our body is held in place by various methods. When we are bombarded daily with fluctuating and cyclic electromagnetic radiation these molecules are moved, including those in our brains, which scientists admit we know relatively little about. We have lived with this bombardment since the dawn of life. It must have affected our evolution, and we must retain some natural and deep link with this phenomenon. As if to prove this point, the Foundation for the Study of Cycles found that sunspot activity is intimately related to mass reactions within both the human and animal populations of the world. Research that stretches right back to 500 BC has shown that every 11.1 years, major upheavals and unrest has risen. So what effect is all this radiation really having upon us? What effects have the radiation and cyclic patterns had upon our evolution? The complexities of the formulae and ingredients are immense and too much for any computer model to predict. And yet our ancient ancestors could predict with alarming accuracy the precise cyclic effects upon the globe and by doing so appeared as gods to those around them. They predicted from the stars the subtle gravitational forces, and understood the physical and mental effects that the heavens would have upon us. They created vast amounts of information regarding astrology and the understanding of the cyclic patterns. Is there some clue here that shows us the secrets of the ancients? We are constantly amazed at just how much our ancestors knew without modern science. Are we yet to be even more astounded? We may find there is much we can learn from them. 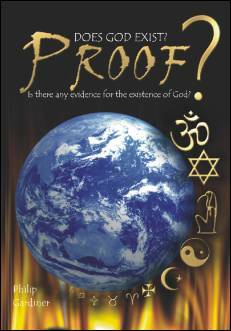 After much acclaim and a very successful start to his writing career with the launch of The Shining Ones in 2002, Philip Gardiner followed up rapidly with his next and equally controversial book, Proof - Does God Exist?. It is the remarkable attempt to try to weigh up all the various pieces of evidence there is for or against the existence of an omnipotent being. Searching through history, archaeology, etymology, philosophy, numerology, science, creation myths and much more, this author leaves no stone unturned and yet makes it easy for the reader to understand. But be warned, it is not a book for the scholar, it is written by a marketing man for the ordinary person to understand, even though it does ask some searching questions. There will be no religious authority, no leader of the church that will be happy with this book, which the author claims takes away the mystery they try to create. On the other hand, there will be no scientist or believer in evolution who will come away unscathed. There is a lot of information in this book which is seriously lateral to current belief and current ideas - maybe we will all need to take another look at our ideas of who we are and where we came from. However, there will be dissent. No religion on the planet is left unscarred and many have already attacked this opening up of sacred and secret teachings. This is not a biased book. It is not a Christian trying to fool you into getting converted or a cult attempting to get into the mainstream. This is an normal, none aligned attempt to find the truth, and anybody who has read The Shining Ones, will know just how much effort this author puts into his research. At the end of the book the author simply hands the decision of whether God exists over to a jury. A cross section of the UK. They decide whether God exists and the result is surprising. The author appeared on BBC Radio Lancs recently, up against a Professor and a Bishop. He was called dangerous. Why? Because he said that faith was personal and for each individual. In the end, the phone-ins backed the author and his straight forward approach. The Professor and the Bishop were accused of dumming down the public – the exact same thing Gardiner accuses them of doing. Proof? Does God Exist? : Is There Any Evidence for the Existence of God? I honestly thought this author must have been joking or quite simply gone mad when he came up with this idea. What on earth gave him the right to poke his investigative nose into this subject? There can never be any proof for God or against Him. And yet I quickly warmed to his method and his intriguing idea of what indeed amounted to proof. In the past we have had the great minds of the world give us their wonderful and philosophical insights into the 4th dimensional or 5th elemental existence of a deity. From Plato to Aquinas we have wandered a road fraught with mental dangers. Whenever we listen to anybody, we simply listen to bias. Most of the apologetics were and are highly evangelical in their methods. Most of the atheists remain disgruntled and violent. The two worlds never meet. Or that’s what I used to think until I read this book. The author is and has been somewhat of an expert in the field of religion and mythology and has appeared on tv and radio assisting in investigations. He never really lets on what he believes, and yet we read his words and warm to him as a human being. This is ideal when reading up on such a subject. We may be reading from the perspective of believer or unbeliever, but either way we will be opinionated. Philip, gently takes away our anger and guides us through the minefield of evidences. Many of these mines I myself did not even realise existed. What on earth is septenary design? Now I know. Eagerly I moved forward through this book and with every step I took I was saved from a blunder by this author. It is so easy to make rash judgements and believe in something without all the information. I am glad I read this book and much like when I read his other work, I had my world changed. It may be his background in marketing and his investigative methods, but every time I read this author he amazes me. I implore you to make no decisions, make no judgements about the world until you have read Proof and the authors other work, The Shining Ones.